One of the things Matt and I were told the most as I was closer to delivering our baby was to get sleep, as neither us, nor our baby would get any for many years. Babies do sleep, of course, though it unpredictable as to when they will. 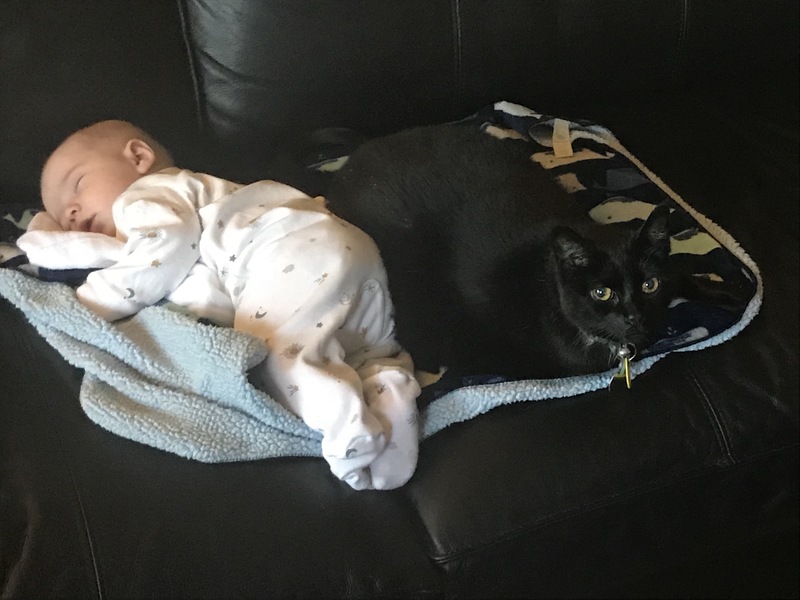 William loves sleeping with his whale blanket and in this photo soon after he fell asleep was joined by Inky who does like to be next to him from time to time, as opposed to avoiding him, which she is more likely to do when he is awake and energized. One of the coolest parts of being a new mom is finding out about children’s books. As a child I was an avid reader, and I knew I’d definitely enjoy sharing that love of reading with our child. However, there are many children’s books I’ve only learned about recently despite them being very popular for children. 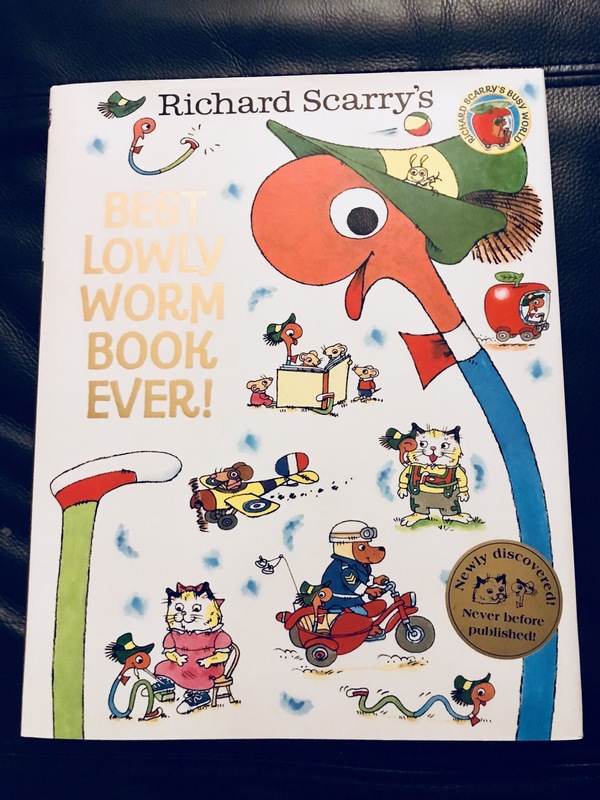 I had no idea who Richard Scarry as until I received a few of his books from Candy including “Best Lowly Worm Book Ever?” as a shower present. As of today William is fourteen weeks or three and a half months old. It’s amazing how time has flown. It makes me grateful that I have had a blog to record things to go back and reflect on later. As the tips below say, he definitely is smiling more now at real live things including seeing Matt and myself. 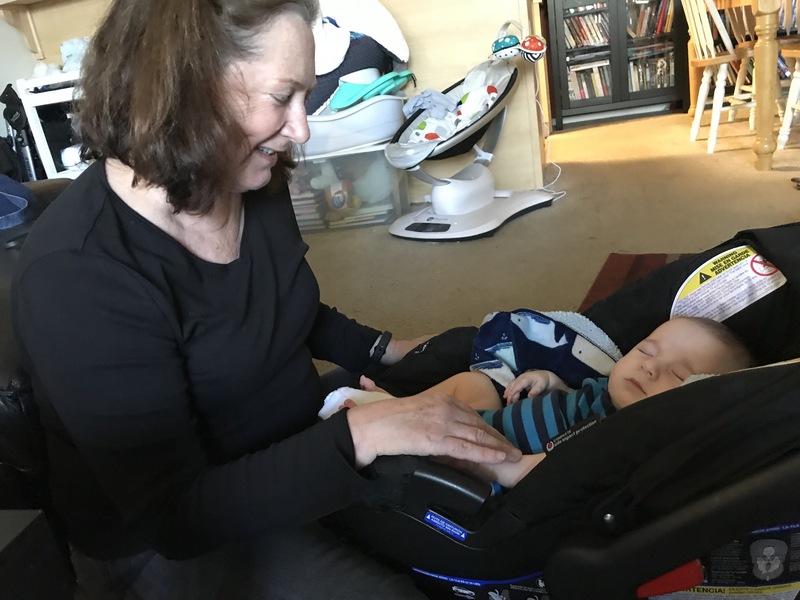 One week ago William was christened at Almaden Hills United Methodist Church. It was a day that had come after much planning on all sides. I was so honored when Candy had asked me if I wanted him to wear the family’s Christening outfit. I was so touched by the offer and immediately accepted, so that he would be the fourth generation Perri to wear it. In addition to the slip, hat and gown that had been in the family and passed down, he also wore a few new items. His socks with an embroidered cross and shoes were presents from Candy. The necklace had been given to me, when I was still pregnant, by Peggy Joy, the Children’s Youth Ministry Leader, who had made similar necklaces for the children of the church. Peggy Joy loves holding William, so we had to get her posing with him while wearing his special necklace. It’s always wonderful to see my friend Kathy. We first met over eight years ago when we both enrolled in Team in Training in order to train for and gain access to The Nike Women’s Marathon. Since then we’ve ran many races together. 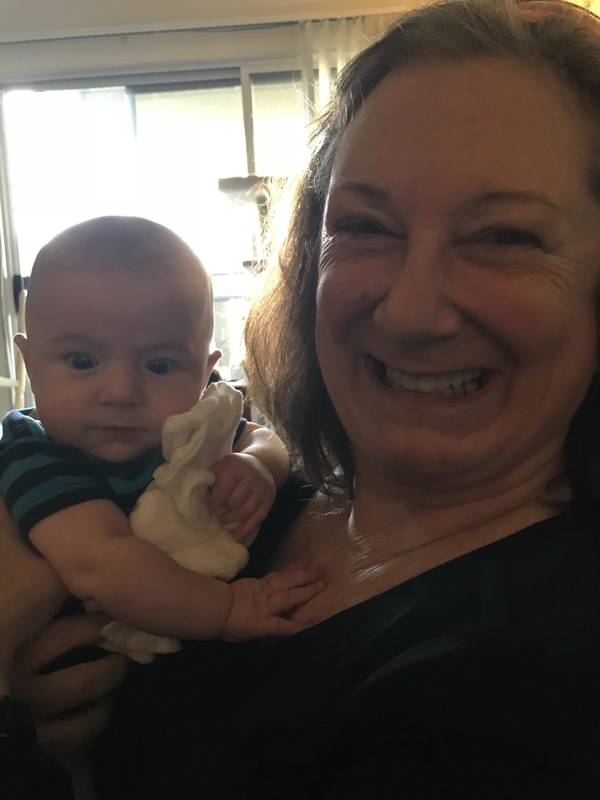 Due to our busy schedules I hadn’t seen her since my baby shower, so I was delighted when they matched up enough for her to visit me and meet William. Although he was asleep when she first arrived, he was soon awake, alert and ready to meet this new person. For some reason he was extra attached to his wipe cloth as a lovey today. Several of my friends who do not root for the 49ers had made suggestions that we should dress William in the color and logo of their team instead. Matt and I had always said if someone had brought us baby gear for another team we would. 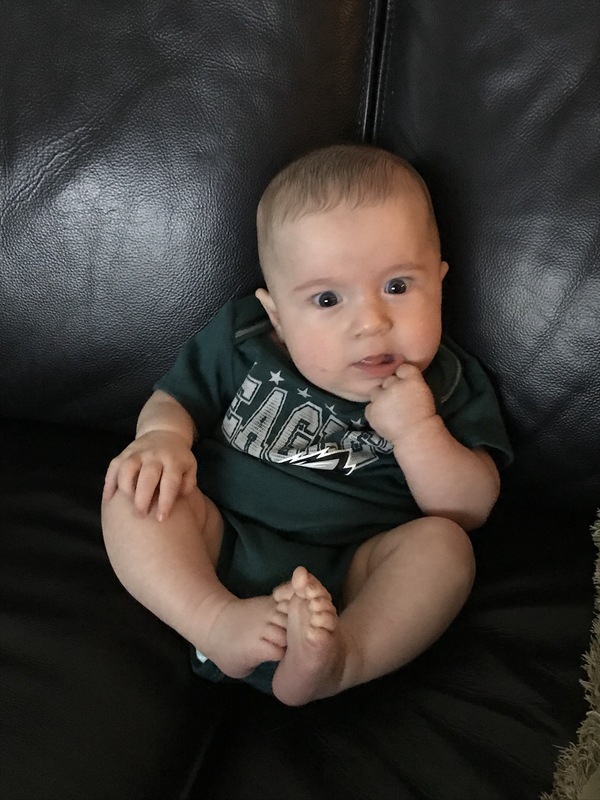 Kathy decided to take us up on that and brought this adorable onesie pack of The Philadelphia Eagles, a Super Bowl contender. As Kathy and her husband, Joe, have been loyal Eagles fans for decades, it’s an honor to able to help root for their team on this temporary basis. While William of course has no idea what was on his onesie, he does appear to be thinking about something intently. I look forward to dressing him in his other onesies as Super Bowl Sunday gets closer. 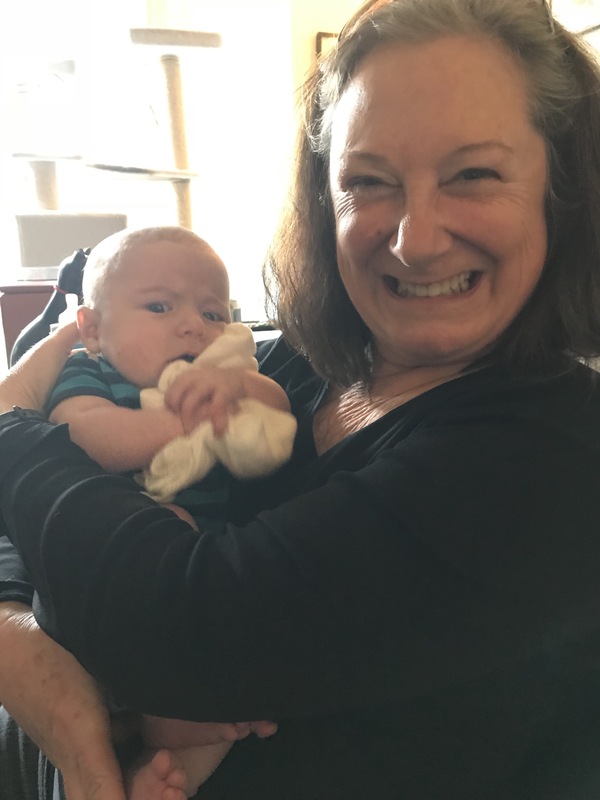 My friend Rachel had told me when she received the invitation to my baby shower that she would be bringing a present she gives to all new moms and that everyone had loved it. I was intrigued by this and looked forward to it. 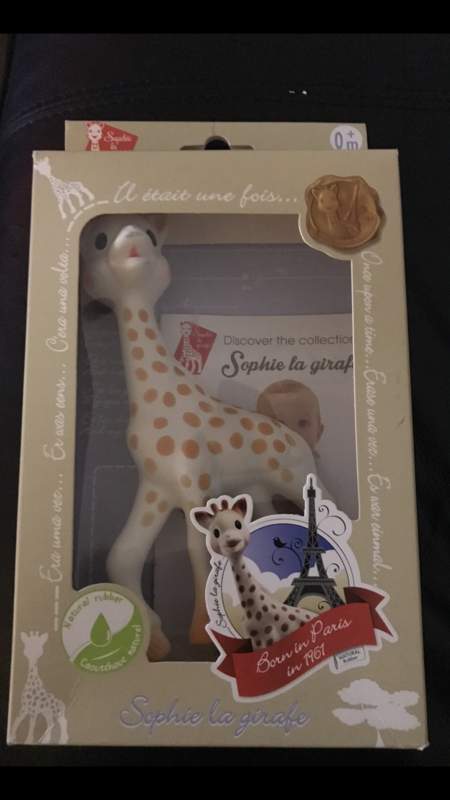 That gift was Sophie the Giraffe, a toy which is famous in many mom circles though I was unfamiliar with it. With the ending of the holiday season, I am seeing and greeting many more visitors at my position at work. To help really shine in my role I’ve been building up my wardrobe again which has been tricky as I am not quite the size I was before pregnancy and breastfeeding, but neither am I the size I was in mid pregnancy when I also bought some clothes for work. Both as it’s fun to hunt for the right wardrobe building pieces at thrift stores, and cheaper to do so, my new finds are from the one nearest us that has many great sales. While I did have the black open cardigan, the white plaid dress and red beads were from the thrift store.